Jo Nesbo’s Harry Hole novels excel at 3 things. The mystery at the core of every Nesbo book is always very twisted and complex. The killer is never the first suspect and his motives are never immediately visible. Most mystery writers rely on one aspect of solving a case: psychological profiling, forensic evidence, legal wrangling, or even good old fashioned police work. Nesbo, however, brings in all these aspects and more. I saved the best for last here, since it is truly Harry Hole who makes these books. The brilliant, (sometimes) recovering alcoholic is a compelling figure. He reminds me in turn of fictional giants like Deaver’s Lincoln Rhyme, TVs House, and the granddaddy of them all, Sherlock Holmes. This being Scandanavian crime fiction, of course, the noir is super-dark. Harry seems to specialize in failed relationships, dead friends, hospital visits, and of course waking up drunk in ditches. Its amazing that someone so messed up can even rally to solve crimes, but he does- and brilliantly! And you love him all the more. My ONLY qualm with the series is that it was not translated in the order it was written. I’ve been waiting a while to find out how it all started. Finally The Bat was published in English! As a stand-alone murder mystery, it holds its own. But its even better as the start of a series, with all the best of Nesbo’s writing already glimpsed in its pages. If you want to start the series, you can pick up The Bat, but if you happen to read the others first, that’s ok too. They remain brilliant page-turning crime novels! This entry was posted in Fiction and tagged book, fiction, mystery, Scandinavian. Bookmark the permalink. I have a thing for Scandinavian crime fiction, I still haven’t finished Hornet’s Nest because I can’t believe it is the last one. 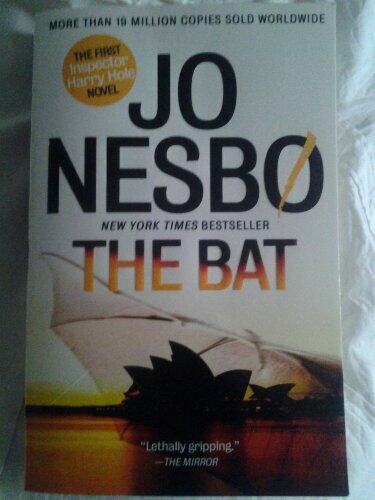 I love Jo Nesbo, and I too was disappointed they weren’t translated in order, but I’m looking forward to reading The Bat!